When I worked in Manhattan I made a lot of trip to the dry cleaners. Wool skirt and pants, silk blouses, cashmere sweaters...all needed to be dry cleaned. I also bought a lot of pantyhose that needed to be handwashed. But doing actual laundry, in a washing machine, not so much. I got home so late from work each night, I often just changed out of my work clothes right into my pajamas. So the hamper didn't fill up very quickly. Fast forward a few years to life on our farm. 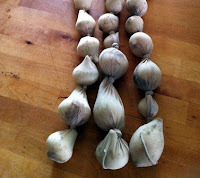 Now, the only pantyhose I use are to store onion garlic bulbs in the pantry. 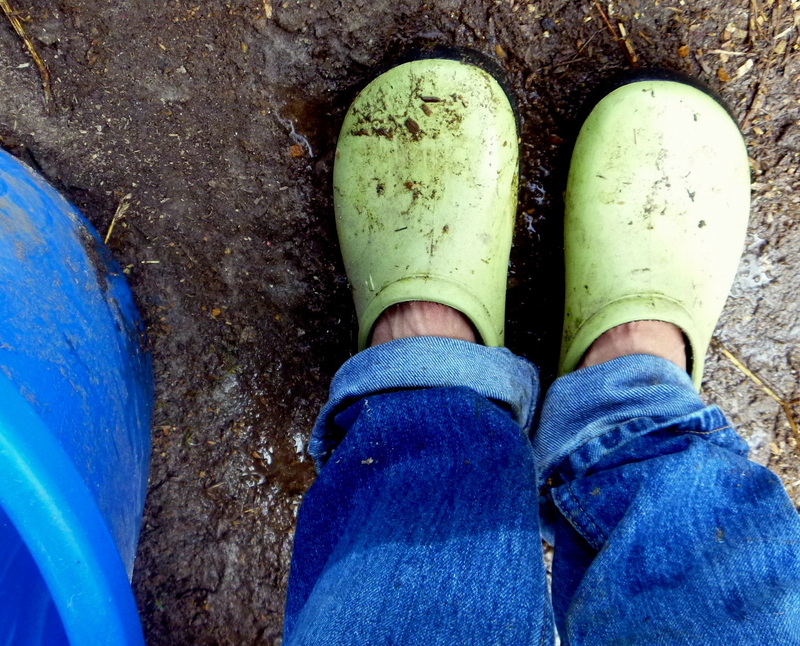 But I seems that every time I go outside, I end up covered in mud, dirt, grass or berry stains, or chicken poop. 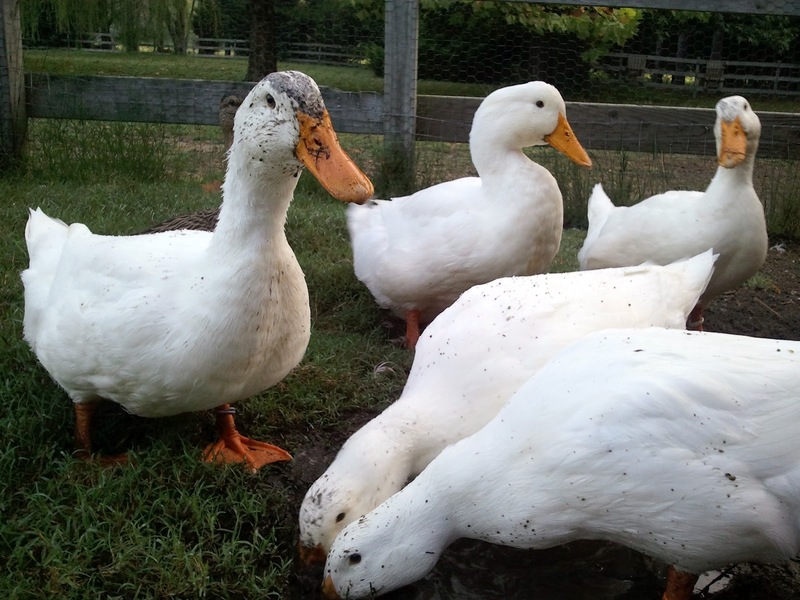 If there's mud the ducks will find it - and if there is none, they will be sure and make some. We also live in the South now so even just sitting outside in the evening in the summer ensures that whatever my husband is wearing ends up as a sweaty, bug-spray covered ball in the hamper. Now that laundry has become a larger part of my life, I decided that our laundry room needed a makeover. If I have to spend more time in there, I want it to be welcoming and cheerful. Our laundry room was painted a pistachio green that sort of reminded me of a hospital. 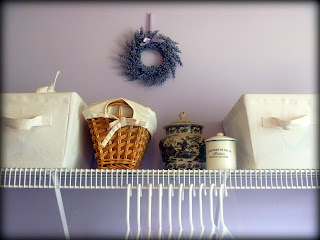 I chose instead a pretty lavender paint and decided to go with black & white toile accents. I found everything except the paint secondhand on ebay or etsy. This was just a mini makeover...new paint, cafe curtains on the window, a coordinating throw rug, a new ironing board cover and matching switch plates, a few accessories to match the lavender and black & white toile motif and I was done. The new brushed steel front-load washer and dryer will have to wait - at least for now. 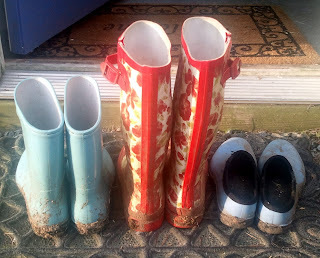 In an effort to reduce the chemicals we use on a daily basis, I have decided as part of the 'makeover' to also stop using commercial laundry products and instead start making my own (also cheaper and better for the environment). In my next blog post I will share some easy homemade DIY recipes for laundry detergent (powder and gel), stain remover, fabric softener and bleach alternative using common household products. There are loads of these recipes on Pinterest and elsewhere online, so I sorted through them to come up with easy recipes that really do work. 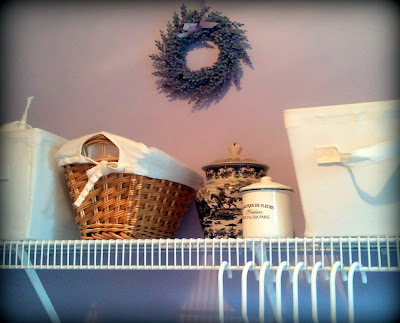 Now that I have a serene, inviting laundry room, I am ready to start filling up these vintage canisters with some homemade cleaning products. Stay tuned for Laundry Room Makeover Part Two for the recipes and how-to. I love the makeover. I too just started making my own laundry soap and household cleaners.Just yesterday I made my first batch of fabric softener and wanted to share it with you because it was delightful and so cheap to make. All you need is hair conditioner, vinegar, and water. The ratio is 6 parts water to 3 parts vinegar, and 1 part conditioner. Heat the water and mix in the conditioner completly before adding the vinegar. Use about 2 TBS per load. Voila! I love the endless possibilitys of scents to choose from and it could not be any cheaper to make. Oh my! I love the new ironing board cover and matching switch plate! Looking forward to your recipes! I've been making detergent but could use a stain remover and bleach alternative. 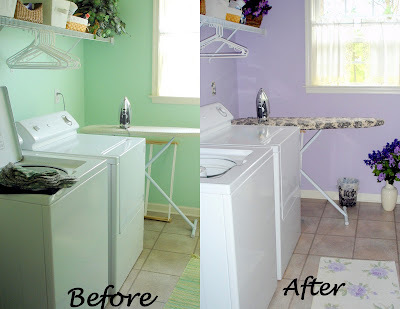 And your laundry room looks so fresh and fun! I have been making my own laundry powder (3 cups borax, 3 cups washing soda, 2 cups baking soda, 1 finely grated bar of Ivory soap all mixed together) for a couple years now, and I have a front loading HE washer. Since I have been using this recipe, my washer doesn't have to be 'cleaned' as frequently as it used to. If you don't have a front load washer yet, they can get stanky (>stinky) due to the residue on the drum. 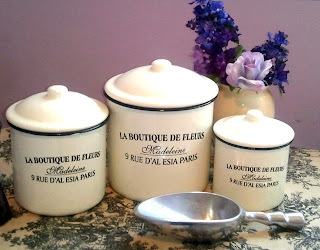 I like the idea of using pretty canisters for your laundry items! How much do you use per load? For my HE washer I use one tablespoon for most loads. On occasion I will use two for true dirt laden loads. Love the Lavender by the way...LOVE IT!!! Such a beautiful space you created to do laundry in! Love it! I never even contemplated redo-ing my laundry room but I am seeing so many fabulous updates for that room that it is now on my list! I'm collecting all these great ideas and will have it posted sometime in the future. And I LOVE my homemade washing detergent. You just can't beat the money savings and it smells so good. I'm pinning the fabric softener today! If you have to do laundry, yours is sure a happy place to do it. The extra laundry seems worth it to be surrounded by nature! 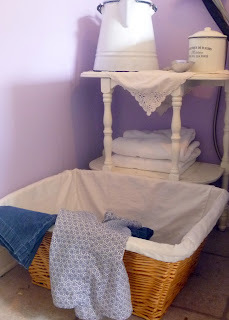 Love the color of your new laundry room - and the toile! Great job at scoring everything second hand - it all came together beautifully! I bet you love doing laundry now (well, almost)! Thanks for joining our All About Color party! Love the lavender wall colour - it's so fresh and pretty :-) And the black & white toile is a great accent. I'm looking forward to checking out your cleaner recipes - laundry detergent makes me choke, so I can imagine how bad it must be for the environment. I'd much rather use a detergent that's chemical-free. It really is so lovely and fresh ... almost makes you want to do the laundry! Thanks all! It was such an inexpensive and easy makeover. Laundry rooms and bathrooms - they're usually small and easy to make over. 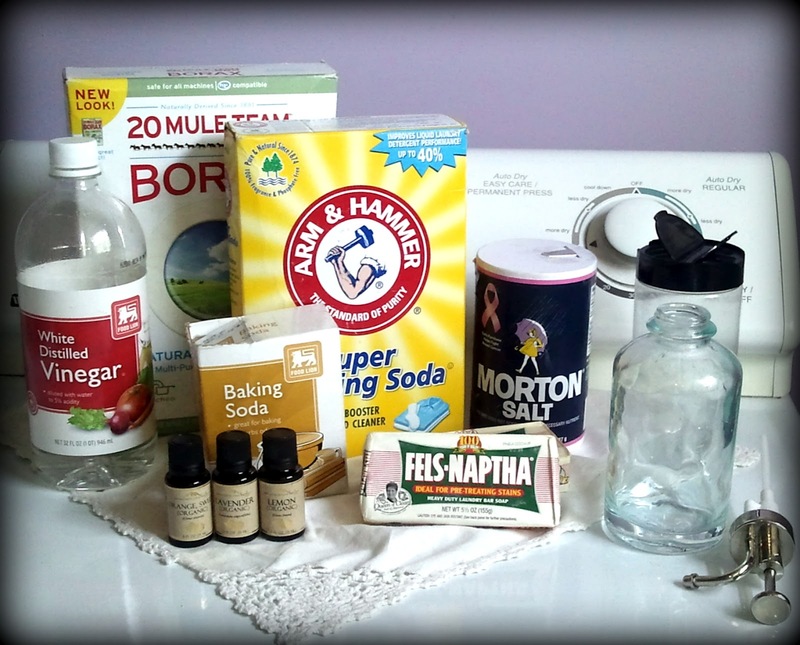 I just love it and I am LOVING the natural laundry products I now use in it too - part 2 of this post. What a cheery, peaceful space now! I was totally planning to make my own laundry detergent today and the island is out of Borax. :( Thank you so much for partying with us! Very beautiful make-over. My niece makes her own cleaning supplies and I must say, I'm becoming convinced I need to make my own. Glad to hear you do. I just made detergent this week for the first time and I am very pleased with it. I am trying not to think about how much I have spent on commercial brands all these years! Enough to buy you that new washer/dryer set I bet! BTW....your before shot looks better than my current set up! What a fresh new look! Love it! Beautiful soothing colors and fun accents! Great job!